There is only one chance to make a positive first impression. Phone Etiquette training develops employees who are polite and helpful on the phone, creating a positive first impression for your business. 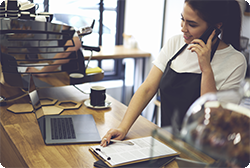 This online learning module teaches your employees how they should answer the phone, speak to customers and expertly juggle phone calls and walk-in guests while providing excellent service. Employees will be more confident when answering and handling phone calls while also providing outstanding service to in-store guests.